The picture above was from the 1963 yearbook called the ‘Sabre,’ which I colourised to give it a bit more life. At the time, DLSL was not even called La Salle but officially the high school department of the Our Lady of Rosary Academy or OLRA. The latter was operated by the Maryknoll Sisters, whose mission in the Philippines had concluded and were starting to prepare for an exit. It was not until school year 1963-64 that the Christian Brothers obtained a permit to operate the fledgling school as La Salle High School. The frontage above was how I saw La Salle from the outside when our school buses passed from the Air Base on our way to OLRA, which at the time was still beside the Cathedral of St. Sebastian. Notice the vacant lot to the left of the picture. 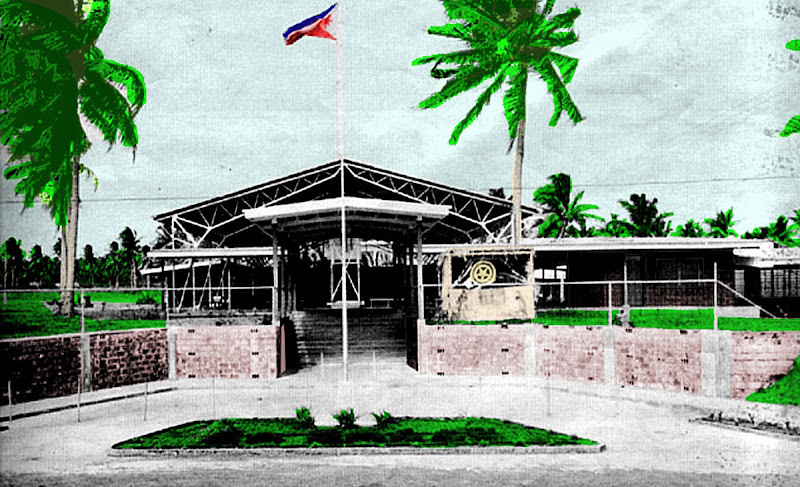 At the time, there were just three red-bricked buildings right side of the gym extending to the edge of the property to what is now called the Lorenzo Ruiz Road. The familiar two-storey building which alumni/ae always loosely referred to as the 400- or 500-wing would not be completed until 1967, if memory serves me right. Notice the coconut grove at the rear of the property. At one point, the badge worn on the left pocket of the white polo uniform was actually a coconut tree. I still have memories of coconut trees lining the football field, so that a common joke about those of us who played football was that we headed coconuts instead of footballs. Click on the pages (numbers) to see how this frontage evolved.